Hardcover, 2 vols., 1,237 pp., 119 pls. Seleucid Coins, A Comprehensive Catalogue, Part 2 is the final part of the authors’ detailed survey of Seleucid coinage, and the first comprehensive treatment of the kingdom’s issues from the death of Antiochus III in 187 BC to the deposition of Antiochus XIII by Pompey in 64 BC. For this period, numismatists and collectors have previously relied on two older published collections, Coins of the Seleucid Empire (CSE) and SNG Israel I: The Arnold Spaer Collection of Seleucid Coins (SNG Spaer), as well as a number of specialized articles. While these have been very useful references, none have covered the broad range of coin emissions for this period, when overall production was relatively greater in quantity. Indeed, coins of this period are more commonly seen in the marketplace as well as in collections. Consequently, a great need exists for a practical and comprehensive reference covering middle and late Seleucid numismatics, and Seleucid Coins, A Comprehensive Catalogue, Part 2 (SC 2) fulfills that need. In addition to integrating and refining the earlier specialized studies, and greatly expanding on the material covered in CSE and SNG Spaer, SC 2 offers many new mint attributions, a few new regnal attributions, and a new chronology for the later Seleucid kings. SC 2 also contains a very important section of addenda and corrigenda to Seleucid Coins: A Comprehensive Catalogue. Part 1, which includes many new varieties that have appeared since that work’s publication. An appendix on Seleucid-related coin hoards offers an up-to-date recording of hoards pertaining to the SC 2 catalogue, as well as a supplement to the hoards in Part 1. Further appendices include specialized studies of metrology, flan production, countermarks, overstrikes, imitations, and fourees, as well as tabular surveys of coin production by ruler and mint, and concordance tables to other major references. The comprehensive nature and high level of detail of this work make SC 2 an indispensable reference in its own right, as well as a valuable supplement to its predecessor. 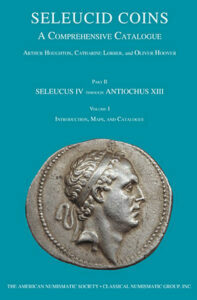 Seleucid Coins, A Comprehensive Catalogue: Part 1, Seleucus I through Antiochus II is also available here.